The Hat Shop is pleased to announce its partnership with The Tamron ♥ Renate Fund. To mark the 3rd anniversary of the fund honoring Tamron’s sister who was a victim of domestic violence, Tamron wanted to celebrate all that has been achieved in a personal and unique way. In an effort to continue to raise awareness for those affected by domestic violence, we have partnered with Tamron to form a dedicated shopping page on Safe Horizon’s website that is inspired by Tamron’s favorite purple Mini Twist Turban. 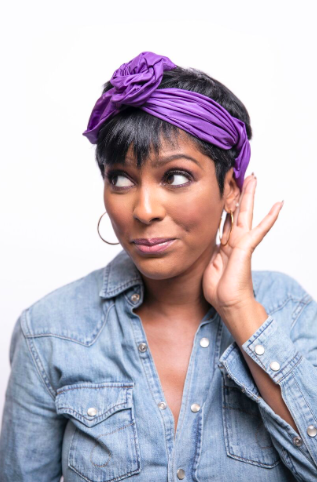 The Hat Shop NYC will be donating 10% of proceeds from every Mini Twist Turban (TM)* sold in Tamron’s favorite color, purple, to The Tamron ♥ Renate Fund. The Mini Twist Turban is available in linen and silk taffeta. The Mini Twist Turban (TM) is 37” long tapering to its ends. It is 7” at its widest. The Turban is wired making it easy to shape into any turban or headband of your choice.